In the Golden Age, the Netherlands had a formidable navy that contributed substantially to the role of the Republic as a great power. Military history is no longer frowned upon and many an admiral has at last been given a modern biography, but we are not so well-informed about the actual working of the fleet. How did ships maintain contact with each other, not only during the voyage, but above all during battle? A system of signalling had been devised by means of flags, the firing of cannon or lanterns. The University Library owns a rare booklet in which all these signals are depicted and described. By making himself known as ‘the nation’s writer at sea’, the compiler inspires confidence. Just to make sure, he had his book corrected by a vice-admiral. Govertsz had it printed at his own expenses and received a privilege from the States of Holland, that is to say, the sole right to sell this booklet. The system was as simple as it was ingenious: the message to signal was determined by the position of the flag, or a combination of flags, on the halyard: on the main mast, the foremast or the mizzen-mast, to the top, or half-mast. The shape or form of the flag also had its specific meaning, such as a single or double tricolour, or a pennant. A thorough knowledge of rigging was of course also essential. Moreover, one or more shots were fired, apparently to draw the attention of the officers concerned. 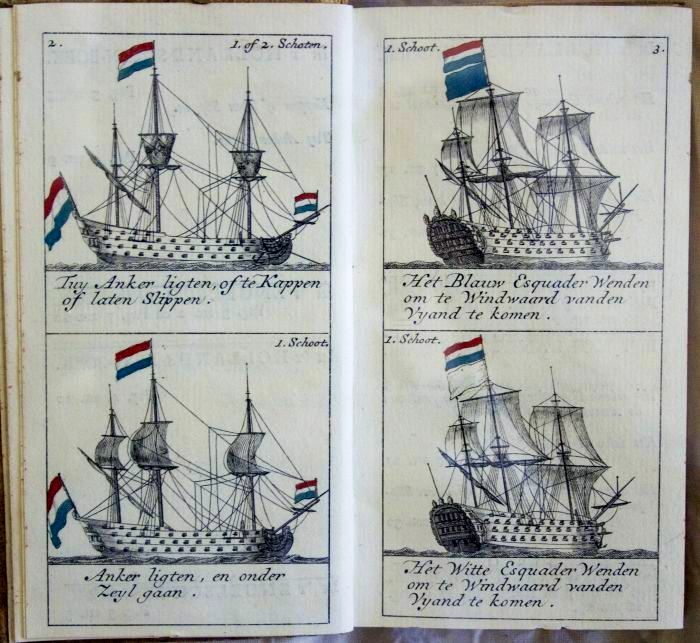 The neatly ordered system in this booklet went of course badly astray when ships went into battle where smoke from gunpowder or fire severely hampered visibility. Mist also put an end to visual messaging and sound had to be relied on: two shots, for instance, signified: lower anchor. At night, instead of flags, a system of lanterns was used which were positioned at various heights on the various masts. The resourcefulness of our predecessors was considerable, but the safety of the fleet and hence of the state has also depended on more uncertain factors.